The sculptures, architectural forms and paintings in Kek Lok Si Temple and Khoo Kongsi reflect the skill and ability of the Chinese artisans and sculptors, and the taste at that time. The development of art, as documented in the Annual Report of the Chinese Education Journal, started 200 years ago when art and craft were taught in Wu Fu XuYuan. Early teachings of art and craft in Penang were held in Tong Sian school and Chong Hwa school. Amongst the early members of the art and cultural community, there were photographers, commercial artists, portrait painters and calligraphers. Most of the calligraphers were clerks working in the commercial firms during the day and set up stores along the roadside in the evening to provide services to the Chinese community. During festival season on Chinese New Year, their calligraphy were hung at doorways or on the walls of the common guests' area. Display of works of calligraphy and demonstration at public areas were common cultural activities regarded as an early form of exhibition in the early days. In the 1920s, Yong Mun Sen came to Penang from Singapore. He worked at Qi Fa Book Shop and made small watercolor paintings during his free hours to earn some extra money. Mun Sen Gallery at No 116, Penang Road was established in 1930. 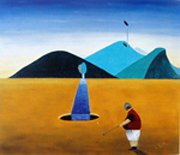 Yong Mun Sen depicted the scenic rural-scape of Penang with spontaneous brush-stroke techniques and refreshing colors. His watercolors had captured the local mood with the presence of blue sky and clean beach; the rice fields, Malay kampung with raised timber houses and coconut trees. The popularity of his water-color paintings had a great influence on the younger generation of artists. The water colour paintings of Yong Mun Sen were displayed at the E&O Hotel. Many foreigners who are tourists and visitors to Penang bought the water colour of Yong Mun Sen as souvenirs and gifts for friends and relatives at home. The popularity of Mun Sen's watercolors enhanced the early development of art in Penang. 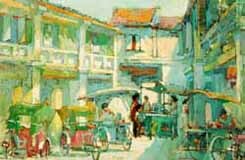 The Ying Ying Art Society was formed in Penang in 1936 by a group of local artist and art lovers. Amongst them were artists, poets and photographers. Lee Cheng Yong, Yong Mun Sen, Guan Zheng Ming, Kuo Ju Ping, Wu Zhong He, Lee Ping Zhai, Cheng Bei En and Lin Zhen Kai were in the list of its committee members. Most of it6s committee members were poets and art enthusiasts. It held its first exhibition at the Li Teik Primary School (5th branch). His Excellency Mr. Huang Yan Kai, the Ambassador of China in Penang was invited to officiate the opening. 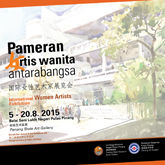 This was the first formal and grand-scale exhibition ever held in Penang. The high quality of the exhibits which included works of sculptures, water colour, oil, Chinese art, calligraphy, photography and stamps by local artists had attracted many supporters. In March 1941,Xu Bei Hong, the renowned artist from China, came to Penang to exhibit his paintings to raise fund to fight the war in China. The exhibition provided the opportunity for Penang art lovers to view his two masterpieces in oil: "The 500 Heroes of Thian Heng" and "Put Down the Whip". He became a close friend of Mr. Loh Cheng Chuan and stayed at Nan Guo Hotel for several months. He encouraged Loh Cheng Chuan and several members of the art community to establish an art society to promote art in the region. Xu Bei Hong's return to China was a rush as it was on the day before the was broke out in China. 1942 to 1945 was the period of the Japanese occupation. All art and cultural activities had come to a stop during the Japanese period. The first exhibition held after the war was the "Penang Photography Society Exhibition" in 1949 at Li Teik Primary School. More than 30 photographers participated in this exhibition including Chen Cheng An, Chen Cheng Fa and Loh Fa Xing. The private collection of Loh Cheng Chuan made up part of the exhibits. In 1952, Xu Bei Hong sent several letters to his friends in the Penang Chinese Art and cultural community to express his concern regarding the establishment of the Penang Art Society. An organizing committee was set up. The founding members were Loh Cheng Chuan, Yong Mun Sen, Lee Cheng Yong, Kuo Ju Ping, Khaw Sia, Goh Chong Hoe, Chamg Lu Ping, Li Dian Mo, Wu Zhe Cheng, Chen Cheng An, Loh Fa Xin, Huang Qing Siang, Chen Jin Chun, Koh Wee Khian and Xu Zhe Ming. 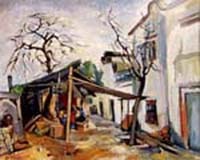 In 1953, the Penang Art Society was formally registered. Loh Cheng Chuan was elected the Founding President. Xu Bei Hong wrote the name of the Penang Chinese Art Society in calligraphy and posted it to Mr. Loh Cheng Chuan shortly before his death. In order to foster an awareness of art and culture, the Penang Art Society had organized many art exhibitions for foreign visiting artists. Zhao Shao Ang, Fang Zhao Lin, Wen Rong Sheng, Yong Shuo Shi, Wu Jian Yen, Zhang Shao Shi Lo Ming, Wang Lao Feng, Xiao Jing Hua, Zhang Da Jian, Wang Qun Pi, Zhen Huo Xi, Ling Jian Shi, Yang Shan Sheng, Yi Qun Zhao, Feng Kang Huo, Huang Du Hua, Liang Jian Nen, Liang Bo Yu, Dao Bo Suo and Zhi Zhi Gao were among the foreign artists who had held exhibitions in Penang under the support of the Penang Art Society. In the 60s, the Penang Art Society held its exhibitions at the Hui An Association. The residence of Loh Cheng Chuan served as the office of the society while meetings were held at Tong Sian School. During the early stage, there were only 36 members. Loh Cheng Chuan felt the need for the Penang Art Society to have its own building so that it could become a venue for art exhibitions and also a place to house donated works by local and foreign artists. On 10th June 1966, Loh Cheng Chuan passed away. Members of the Penang Art Society decided to hang his portrait which was painted by his grandson, Loh Yi Dong, in the Society's meeting room. On 10th June 1966, Dato' Koh Pen Ting was elected President of the Penang Art Society. During his term as the President, the Penang Art Society held its regular meetings at the premises of the Rubber Trade Association. 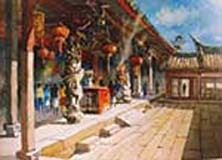 The Penang Art Society was a set-up with various sections: Painting ( Western and Chinese Art), Calligraphy, Drama, History, Engraving and Photography. Each section was to organize its own activities. In 1971, the Society organized the "7th Malaysia-Thailand Poets Get-Together Dinner" held in conjunction with the Moon Cake Festival at the Rubber Trade Association. Dato' Koh Pen Ting and the Buddhist master Zhu Mo hosted a dinner which was attended by more than 260 poets from the various regions of South East Asia. Dato' Koh Pen Ting wrote a couplet which was hung on the two pillars at the main entrance which further enhanced the cultural mood of the occasion. In 1976, a campaign to raise funds for the Penang Art Society Building Project was launched. With the co-operative spirit and enthusiastic support of the artists and art enthusiasts from the various regions of South East Asia, a total of 380 donated art work were received. An exhibition, related to the campaign, held at Dewan Sri Pinang managed to raise RM50,000 from the total sales of art work. The remaining art work which are now kept by the Penang Art Society are documented in the Society's 50th Anniversary Catalogue. 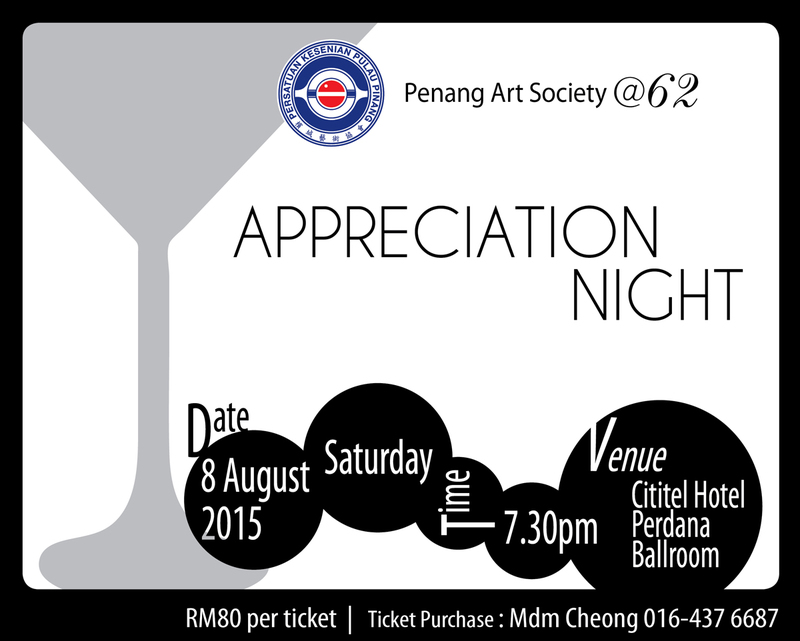 Later on, the Penang Art Society committee successfully raised another RM70,000. The total amount collected from donations was RM80,000. The President of the Penang Art Society, Dato' Koh Pen Ting who was also the Chairman of the Penang Chinese Town Hall, proposed to donate the amount to the Penang Chinese Hall as a contribution to its building fund in return for a space at the Penang Chinese Town Hall which would be used as the new location of the Penang Art Society. The Committee accepted the proposal for goodwill and mutual support. However, the space allocated on the 3rd Floor, Room 307 was found to be too small and unsuitable for holding exhibitions but can only be utilized as a place for meeting. As a matter of fact, the Penang Art Society as a non-profit organization felt the burden in paying the annual maintenance and insurance fees. The official moving to the Penang Chinese Town Hall building on 26th July, 1983 was a memorable and historical event. Not only did it symbolize the excellent leadership of the late Dato' Koh Pen Ting, but it also realized the wish of the late Mr. Loh Cheng Chuan. As the occasion coincided with the celebration of the 30th Anniversary of the Penang Art Society, various art and cultural activities were held. They included an exhibition of art, photography and bonsai, and a singing competition for a fund-raising campaign for the Lam Wah Ee Hospital. The events coincided with the official opening of the Penang Chinese Town Hall. The overall response was indeed overwhelming. When membership increased to more than 200, the Penang Art Society further expanded its divisions to include drama, dance and hospitality. The Society with the support of the Penang State Art Gallery, began to hold its annual exhibitions at the Penang State Art Gallery. It had organized art forums, art demonstration and seminars on Chinese Ink Painting, photography and Chinese poetry. 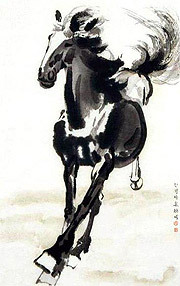 A Chinese Ink painting class was conducted by Teo Phaik Eng in 1986 at the Society's premises. 1986-1990: The Penang Art Society co-operated with Kwong Wah Yit Poh to organize an "Outdoor Children's Art Competition". More than 1,000 students from both primary and secondary schools participated in this series of competitions. The Penang Art Society had encountered financial problems due to difficulty in collecting monthly subscription which was only 50 cents per month from its members. Although the registered number of its member was 253, many of those who had changed their addresses could not be contacted. Very often the committee members had to fork out the money themselves to pay the general expenditure. Therefore, on 26th April 1987, the committee meeting decided to amend the society's constitution. Under the new rule, each member was required to register his/her membership. Instead of paying a monthly/annual subscription, a member was required to pay RM100 once only to register as a life member. This new policy had to be abided by all members including those who apply to become new members. The 2nd December 1990, was the official date of appointment of Y.A.B Dr Koh Tsu Koon, as the Chief Minister of Penang. The Penang Art Society congratulated him by placing a congratulatory message in the newspaper. He served as head of the literature and history section. The Poetry Section of the Society celebrated its 17th Anniversary by organizing the "Overseas Poets" get-together Dinner" on 11th September 1990, the day of the Moon Cake Festival. More than 100 guests attended the dinner. The poetry section managed to raise fund for its regular activities. On 3rd April 1994, Dato' Koh Pen Ting decided to step down as President of the Penang Art Society due to failing health. He was succeeded by Mr. Koh Wee Khian. The committee agreed to honor Dato' Koh as the Honorary President of the Penang Art Society for life and would place in the meeting room of the Society. Mr. Koh Wee Khian was then elected as the 3rd President of the Penang Art Society. Mr. Lim Su Mun JP, was the Vice-President. 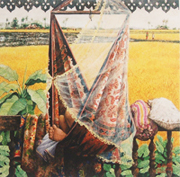 In 1994 and 1995, the Penang Art Society's Annual shows at the Penang state Art Gallery were successfully held. Publication of a full colored catalogue was to document the art work and to further enhance the artistic and cultural image of Penang. In August 1997,the poetry section published "A Collection of Poems". The editor was Mr. Zhou Zhi San and the assistant editors were Liu Zou Yun and Lin Hai Xu. The publication was well received by all the members of the poetry section and lovers of Chinese classical poems. In June 1998, Mr. Yau Kheng It, who served as the treasurer of the Penang Art Society donated two display cupboards and several valuable art efacts to the Penang Art society for the purpose of decorating the meeting room of the Penang Art Society. In December 1998, the Penang art society's music section in collaboration with the Penang Education Department organized the "Penang School Orchestra Performance" at the P. Ramlee Auditorium. Mr. Koh Wee Khian and Dato' Kee Phaik Cheen congratulated and praised the musicians for their excellent performance and for contributing towards cultural interaction and the advancement of the arts in the region. On 23rd January 1999, the Poetry section co-organized the "Appreciation of Poems of the Three Kingdoms" with the Penang San Guo Yan Yi (Three Kingdoms Society) at the Conference Room, Level 5, Komtar. The occasion was graced by Y.B. Dato' Lo Gen Yu, President of the National Society of San Guo Yan Yi, Y.B. Koay Kar Huah, and Mr. Koh Wee Khian who were invited as speakers. On 11th January 2000, Dato'Koh Pen Ting, the former President of Penang Art Society passed away. At the funeral, the Penang Art Society committee expressed their condolence with a couplet written on a scroll and donated a RM500 token to support the Chinese Independent School Foundation. The contribution of Dato' Koh Pen Ting as President of the Penang Art Society was notable and would always be remembered. During his time as the President, he initiated the establishment of the National Society of Chinese Poetry. The Penang Art Society obtained the space at Level 3 Room 307 in the Penang Chinese Town Hall. He hosted a get-together dinner in Penang for the poets from overseas. Under his excellent leadership, the Penang Art Society had successfully increased its fund for activities. On 10th March 2001, the poetry section co-organized with the Kwong Wah Yit Poh to hold the "Children's Poetry Competition ' at Komtar level 5. Y.B. Dato' Koay Kar Huah launched the opening. The response was overwhelming. On 2nd October 2002, to commemorate the 48th Anniversary of The Penang Art Society, a grand dinner and an exhibition were held. In conjunction with the dinner which was attended by more than 100 people, a fund-raising campaign was carried out. It was to collect funds for the society's activities and for the cost of publishing the Anniversary's exclusive catalogue. Y.A.B. Tan Sri Dr Koh Tsu Koon was the Guest of Honor at the dinner which coincided with the celebration of the Moon Cake Festival. Y.A.B. Tan Sri Dr. Koh Tsu Koon in supporting the Penang Art Society donated RM10,000. 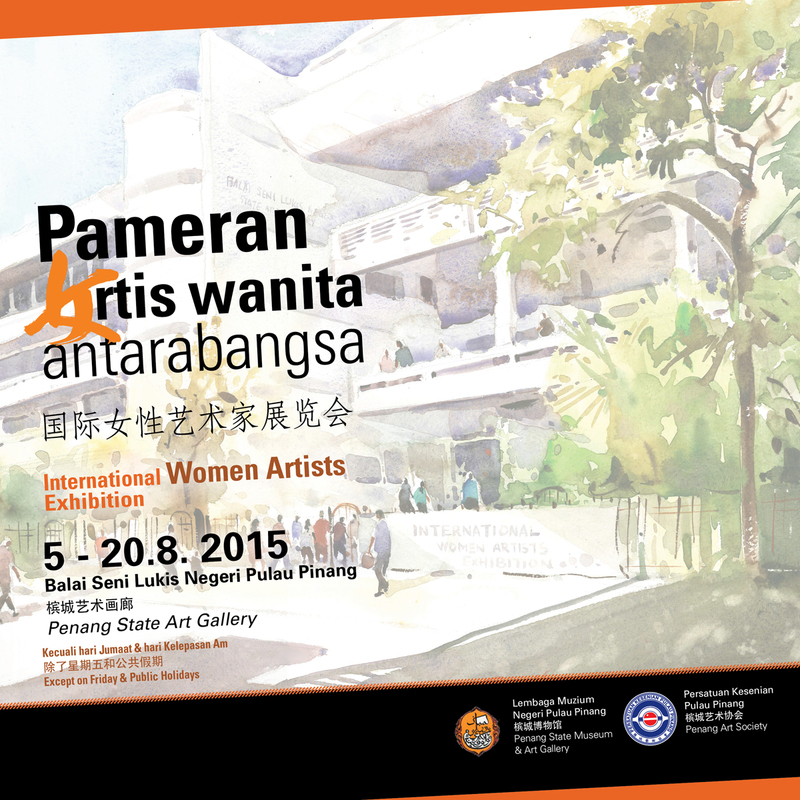 The Penang Art Society had successfully collected RM80,000 through donations. The newly established Penang Art Society Orchestra played enchanting classical music to entertain the guests at the dinner. On 23rd March 2003, the Annual General Meeting of the Penang Art Society made amendments to the Society's Constitution to provide for the heads of the various sections to become committee members automatically by virtue of their post. The number of committee members shall be 11. 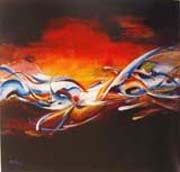 A member of 7 from the heads of the various section, viz: 2 from the Painting Section, and 1 each from the other sections namely Calligraphy, Poetry, Music, Photography and Engraving. The head of each section shall be elected by the committee or be appointed by the President of The Penang Art Society. Twenty-two members shall form a quorum at the Society's General meeting. Any new members whose membership is less than one year shall not have the right to vote. On 11th June 2003, notification of approval of the said amendments was received from the Registrar of Society.